Didi The Cat Charity invites you to ADOPT A FUREVER FRIEND 2017 & DONATE FOOD FOR STRAY CATS. Adopt a fury friend and donate cats food to support of our local pet sanctuary, Malaysia. 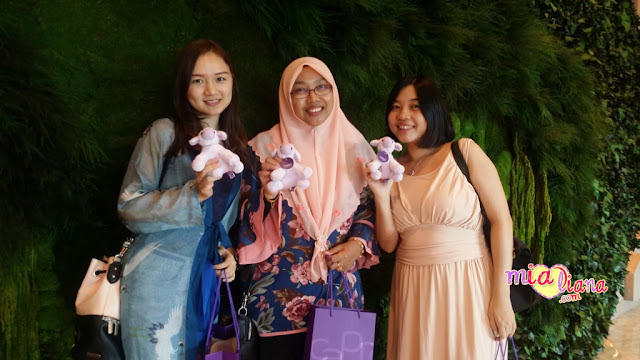 "Didi The Cat Charity is a small organization to help out stray cats in Malaysia. Its a platform to give a chance to cat's lovers to spread their love. We are currently based in Penang as we are helping out all the free Cat's Sanctuary here cause most of this sanctuary need help from the society. We dont accept any money, but we are welcoming Cat's food donation . They need help with this as cat's food is very expensive and lots amount of cats here need lots of food too. We dont have any specific requirement for the cat's food, we even accept the balance of your cat's food as long as you sincere to donate! Here got hundreds of cats that will tell God how generous you are. 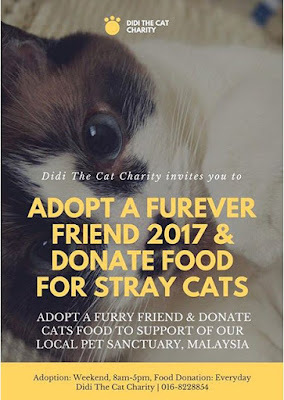 Any question you may call me at 016 8228854 and if you want to know more about this new organization you can go to www.didithecatcharity.blogspot.com"